In the final three weeks of 2014, Martin Doyle abandoned the Irish winter for a well earned vacation in the form of a first time visit to New Zealand and the unique experience of Christmas in a sunny southern summer. After an epic thirty-six hour journey via London, Abu Dhabi and Sydney, Martin finally arrived in Christchurch which is in the Canterbury region of New Zealand’s South Island. During his stay in Christchurch, Martin was involved in a couple of informal music sessions that were held at The Lotus-Heart vegetarian restaurant. 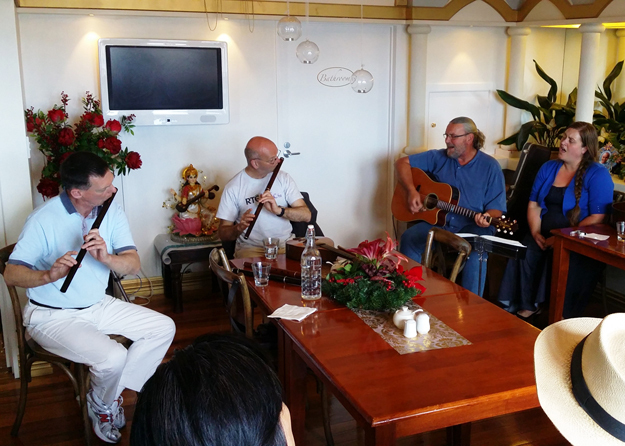 An informal music session at The Lotus-Heart – from left: Shardul, Martin Doyle, John Wood and Jade Bell. Martin also enjoyed a visit with local musicians Jade Bell and John Wood who live at Fisherman’s Point at the southern tip of Lake Ellesmere. Jade and John perform as a folk duo around Christchurch and were also involved in The Lotus-Heart sessions. After a delicious meal that was kindly prepared by Jade, the musicians played tunes on the patio in the shade of a lovely old tree. Here is a snippet from that session – a sweet jig known as Father O’Flynn. Music is such a powerful medium for portraying feelings of every kind and, based on the tune Father O’Flynn, the man himself must have been a sweet and likeable sort of character. The lyrics of the song seem to reflect that sentiment as well and make a very creative and humorous piece of poetry. So that you have no excuse not to sing along with John, Jade and Martin, we have included the lyrics below. Father O’Flynn as the flowr of them all. And kindliest creature in ould Donegal. Father O’Flynn d make hares of them all! Truth! and conchology if hed the call. Youve such a way wid you, Father avick. Lifting the lazy ones on wid the stick. At comicality, Father, wid you? “Is it lave gaiety all to the laity? Cannot the clergy be Irishmen, too? A little more research turned up some information regarding the life and activities of Father O’Flynn. This entry was posted in Irish Traditional Music, Martin Doyle, Musicians, Video Clips and tagged Christchurch, Father O'Flynn, Jade Bell, jig, John Wood, lyrics, music, New Zealand, restaurant, sessions, The Lotus-Heart, YouTube on 10th January 2015 by Admin.